When the Blog Awards Ireland longlist was recently released, I was thrilled to discover Bibliocook nominated in three categories. I’m there in the food/drink category, the popculture list and, most astoundingly of all, in the photography selection. Check out those lists – they’re a great way to rediscover old favourites, along with finding new blogs that you might never come across. Another way of doing that is to volunteer to be a judge for the awards. It doesn’t take too long to do, you never know what you’ll be allocated to look at and it will definitely make you look at your own blog in a new, more critical light! 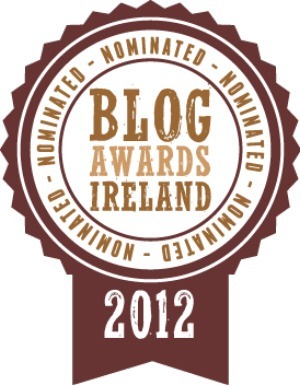 Well done to the Blog Awards Ireland organisers for all the work that they’ve been putting in – and it’s not over yet! The shortlist is due out on 8 September, followed by the awards ceremony, which takes place on 13 October.